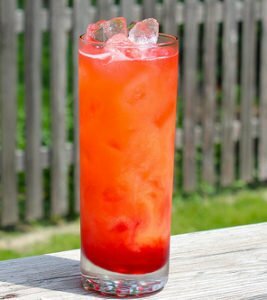 The Sloe Screw, also conveniently misspelled as a Slow Screw, is a fun little cocktail. The reason for the semi inappropriate name of the drink comes from the fact that the drink uses a healthy dose of Sloe Gin. Adding that sloe-berry flavoured gin to your standard vodka and orange screwdriver, and you have a Sloe Screw. This is a bit of an older cocktail, so not one that we currently teach to our up and coming bartenders. This gin and orange juice based drink also a perfect revitalizing morning or brunch cocktail. Note that if you are familiar with the Wallbangers, you can have a little more fun with this cocktail. I recall a few years ago when taking the bartending course here I had to memorize the Slow Comfortable Screw against a Wall. This of course is one of those crazily named cocktail that is fairly easy to decipher if you know the different cocktail and their components. We know that making a drink ‘slow’ only requires the addition of slow gin. To make a drink ‘comfortable’ we of course need to add the bourbon based liqueur Southern Comfort. The screwdriver recipe is well known and to put this cocktail ‘against the wall’ we will need to finish it with a float of Galliano. Prepare this drink the same as you would for a Slow Screw. Build your cocktail in a tall highball glass, but be sure to float your 1/2oz of Galliano on top. Your guest needs to get that aroma from the Galliano when the drink first arrives. They can mix the spicy vanilla liqueur in to the beverage themselves…with a straw or stir stick.